One of our favorite quick Midwest getaways is Kansas City. It’s been a while since we visited during the holiday season (check out all the incredibly fun things we did when we spent a holiday weekend in KC in 2015). We returned to visit some new (and new-to-us) places, including Worlds of Fun’s WinterFest. We did it all in about 24 hours…with kids. Pick the right hotel: For this trip, we knew there were some definites for the trip: We wanted to try ice skating on the terrace in Crown Center, we wanted to visit the Country Club Plaza to see the beautiful lights and decorations, and we were going to WinterFest. Two places were much closer than the third. We stayed at a Holiday Inn in Kansas City that was within walking distance to the shops and restaurants (and holiday lights) at the Plaza. So, we picked Crown Center/Country Club Plaza for our hotel spot: The Holiday Inn Country Club Plaza, which is great for families. Our complimentary stay was provided by our trip hosts, Visit KC, so I can write about it (check the blog last this month!). The only downside to the hotel was that the pool was seasonal since it was outdoors, so that disappointed the kids. If a pool is a must, I recommend the Sheraton in Crown Center in the area. The rooftop heated pool is great, even in the winter. If your activities are further afield, here are two other hotels worth checking out: DoubleTree in Overland Park, Kan., and The Courtyard in North Kansas City (a good choice to be closer to Worlds of Fun). 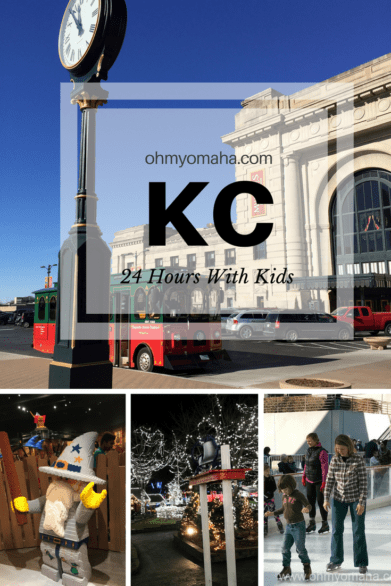 Kid-Friendly things to do in 24 hours: We arrived in Kansas City in the morning, and were able to see quite a bit before checking into the hotel. Science City inside Union Station has several indoor and outdoor exhibits that are interactive and fun for all ages. Our first stop was Science City, which is a favorite stop of our family’s, and we go nearly every time we’re in Kansas City. Our visit was complimentary. 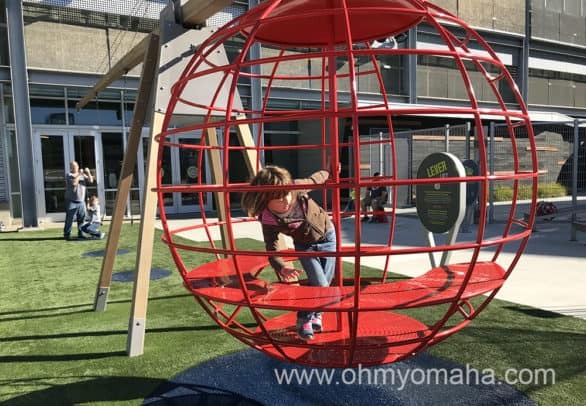 Tip: If you have a membership to Omaha Children’s Museum, your admission is free to Science City! Next, we walked the elevated pathways to Crown Center where there are shops, attractions like LEGOLAND Discovery Center, restaurants, and our next destination, Crown Center Ice Terrace. The Ice Terrace at Crown Center is open throughout the winter in Kansas City. The Ice Terrace is a seasonal, outdoor ice skating rink open November through February each year. It’s a popular activity, so expect a bit of a wait to get your skates. We had lunch afterward at Crown Center. 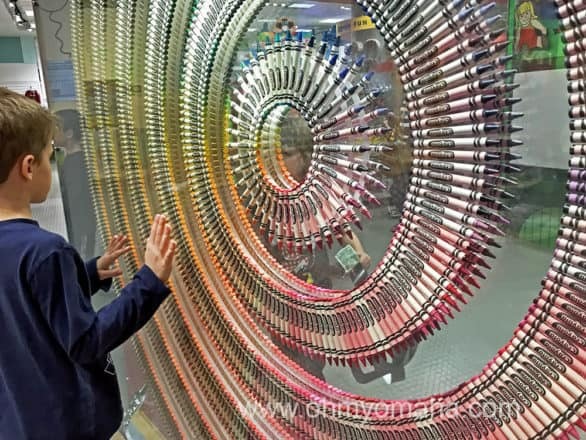 If you walk around, you can come across a couple kid-friendly shops like a toy store and a Crayola shop. My son loves all things art so the Crayola store was a good stop for him. Depending on how long it takes to eat and walk, you may have time to check out the shops before checking into the hotel. Our next stop was WinterFest at Worlds of Fun, which is an evening-only event, so we had some time to kill at the hotel. This would be a good time for a cat nap if your kids need one; if your kids don’t nap, you can go to Worlds of Fun before the event actually starts (you can get inside at 4:30 p.m., though the event starts at 5 p.m.). We wandered into a space that felt at home in CandyLand, complete with a candy cane lane and gingerbread men. WinterFest started just this year at Worlds of Fun, and it was a hit with every age in our group. It runs until Dec. 30. Food is pricey–it is an amusement park–so I suggest snacks there and eating outside the park before or after. The next day, we had breakfast at Eggtc, and arrived just in time to beat the local rush. This was one of my favorite breakfast spot discoveries yet. Another breakfast recommendation is Blue Bird Bistro. If you choose to stay at Holiday Inn, kids eat for FREE with an adult entree. 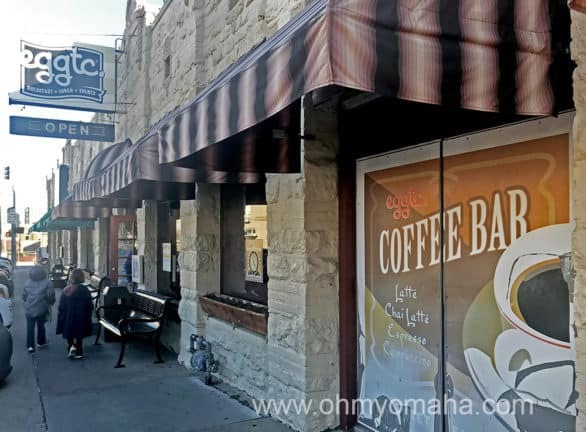 There are a couple Eggtc locations in Kansas City, and one is about a mile from the County Club Plaza and the Holiday Inn. It’s very kid-friendly. Well fed and caffeinated, we headed for LEGOLAND Discovery Center. If you have a lengthy drive ahead of you, this is a good place for kids to let off a lot of energy before getting buckled in for ride home. You could spend about two hours there, and I recommend not skipping the 10-minute 4-D movie–the kids loved it. There are two rides, but I wouldn’t let that be a selling point. This is not an amusement park, so manage your expectations in that direction; it’s more for building, and admiring creations, and there is a sufficient amount of play spaces for kids to explore. 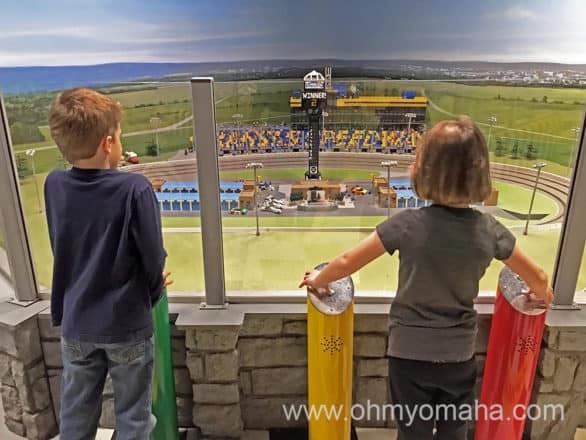 LEGOLAND Discovery Center in Kansas City has a lot of hands-on play, two rides and a 4-D movie. Before leaving, we had lunch at Fiorella’s Jack Stack BBQ, a Kansas City institution with five locations. A good thing to note: There’s one location super near Union Station with a pedestrian bridge connecting the two. It’s another great kid-friendly place to try. 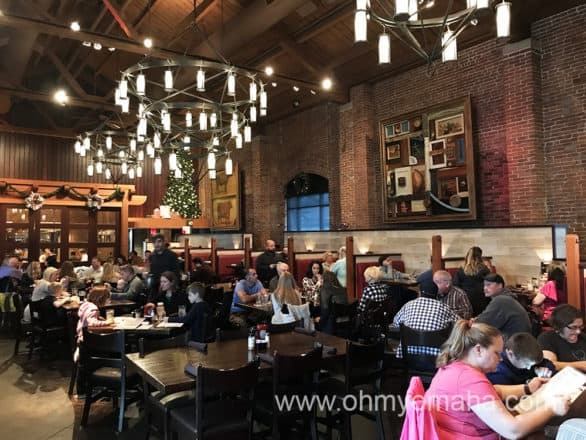 The large dining room at Jack Stack in Kansas City. Serving sizes are large. Want more KC family vacation ideas? Looking for more things to do during the holidays? 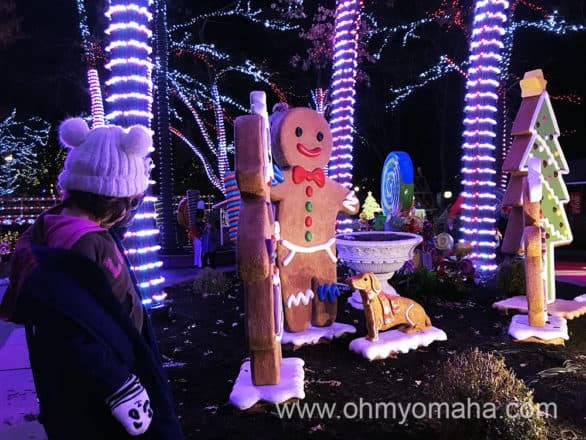 Here’s a post with 15+ fun things to do in Kansas during the holidays and a KC Holidays Bucket List. 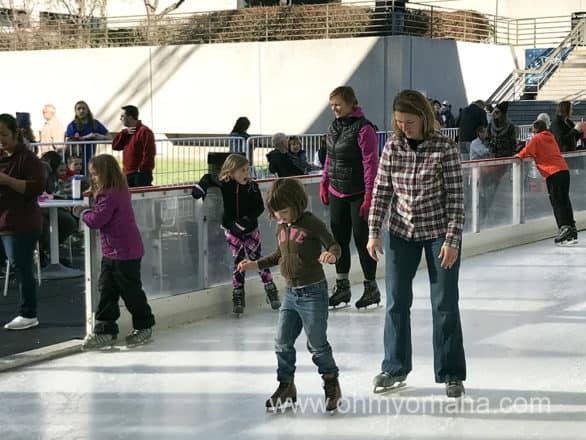 If you have a little more time for your visit, check out fun things to do in the winter with kids in Kansas City or see what family-friendly activities are near Worlds of Fun.